French progressive metallers revealed the new artwork for their upcoming album L’Enfant Sauvage today. Keeping with the theme of esoteric visuals and a vein of the natural world the art is centered around a person being surrounded by fading skyscrapers. 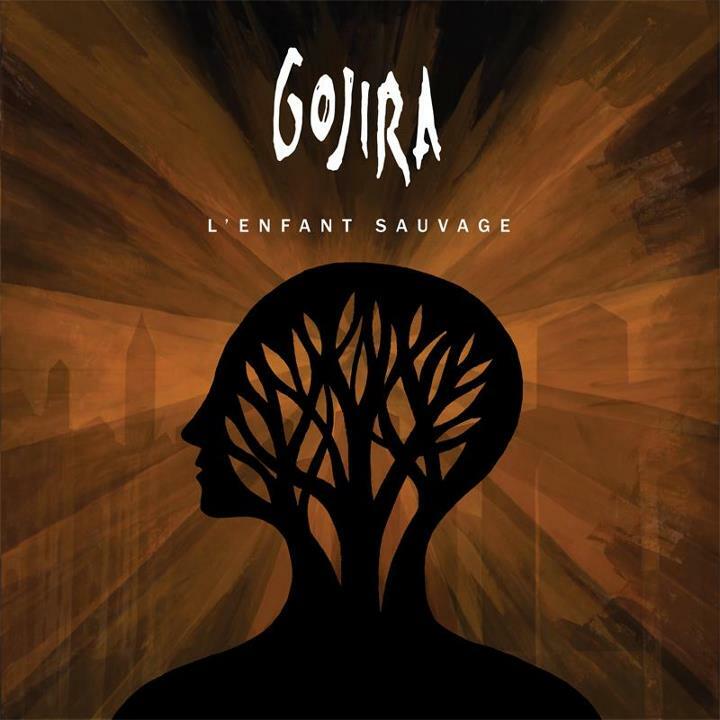 L’Enfant Sauvage will be Gojiras’ first release since 2008s The Way Of All Flesh. Gojira are still to release The Sea Shepherd EP which was recorded onboard the vessel the Sea Shepherd as the Band raised awareness for the fishing and murder of whales, the topic of 2005s From Mars to Sirius, by Japanese trawlers. The band also documented the recording of L’Enfant Sauvage in New York with a series of Youtube videos. Tell us what you think of the cover and how excited are you for this new release in the comments! Having formed almost a decade ago, Bloodshot Dawn have rising through the ranks of the British death scene since their formation in 2003. Their UK tour kicks off tomorrow as they support the mighty Italian powerhouse Fleshgod Apocalypse, while today sees the release of their debut, self-titled album which had been composed for almost two years and finally recorded in Rome in late 2011. The enchanting and atmospheric keyboards of Beckoning Oblivion start the album, adding a strong orchestrated feel to the track, much like that of Dimmu Borgir, Children of Bodom and the aforementioned Fleshgod Apocalypse. When the guitars finally kick in, it’s apparent that this is going to be to one hell of an album. The vocals are a small reminder of Gorod, helping build up the strong death metal sound. The guitars are more melodic than I expected yet they keep a constant flow of destructive bite, something a lot of melodic death metal bands fail to do, in my opinion. The two solos, provided by frontman Josh McMorran and lead guitarist Benjamin Ellis, fend off a potential stale sound, keeping the song fresher than a freshly picked apple. Dedication to a Dead Cause starts with a very thrash-orientated sound before progressing into a Death-meets-Ex Deo combination. The bass, provided by Anthony Ridout, gives the song a very defined sound, while the vocals give it a character of brutality. Forlorn World takes the album down a less-melodic road. The drums and guitars add a sound more violent than an old school ECW match, the vocals on the other don’t seem to sound right with the riffs, like they have on the past two tracks – It could just be the way the track was mixed in the studio, as opposed to any flaw in the actual composition. Remember when I said this track is less melodic? Yeah? Well, I lied. The solos bring back the melodic elements, sort of like a heavier Iron Maiden but the track soon changes back to a pounding onslaught of aggression. The next track is the free-to-download single, Godless. Musically, the song sounds like a combination of the last three tracks with some newer elements but that doesn’t stop it from sounding awesome. The vocals have stepped up since the last track as well, contrasting well with the riffs. Some of the riffs sound quite Arch Enemy and Children of Bodom-esque. The fast-paced, melodic stylings of Visions takes the album by storm next, doubling the dose of aggression and savagery in the music. In true death metal fashion, comes Sentiment Disease. The slower-paced intro acts well as a crescendo, building up into the main bulk of the song which is composed of acute drums and tantalising riffs, with a dash of aggressive and barbaric growls. The guest solo by Sebastian Nilsson [Aeon] is definitely a strong point in the album. The Quantum Apocalypse has a quite unique sounding introduction, especially when compared to the previous tracks. The vocals seem to have taken on a Napalm Death/Children of Bodom sound, though they seem to be quiet compared to the guitar sections, which is very disappointing since McMorran’s vocals are enjoyable to listen to. The majority of the track feels quite tame and laid back causing it to be somewhat of a let down. The following track, Sickening Dogma, brings back the excitement and forces into the listener’s ears like a lethal injection. The bass riffs are quite distinct, amalgamating blazingly with the drum workings of Doug Anderson. The riffs have a quite melodic and groove sound to them, a plus for any groove metal fans out there. Slowly coming towards the end of the album comes Illusion Aesthetic. The riffs are merciless executed with intense precision, giving the song a very cutting-edge element. The drums ring out cruelly, keeping the song vicious which is always a plus. Prototype acts pretty much as a guitar-orientated interlude between the previous track and the final part of the album, Archtype, which blasts its way through with a melodious guitar section that morphs into a savage assault of demonic vocals and skull destroying riffs. The track is quite agile, as well as disturbingly bloodthirsty. Prototype certainly lets the album end on an enraged note of sheer melodic brutality. While I am left wondering why it’s taken them so long to finally release an album, I’m also left with a big impression of the band’s talent. The album, overall, is well worth the money and would fit into any metal fan’s collection. Some of the melodic use of guitars can be a bit tedious at times and while the vocal sections on a couple of the tracks are a bit disheartening, Bloodshot Dawn could easily have their own place in the history of death metal with this release. 6th – White Rabbit, Plymouth. 7th – Purple Turtle, London. 8th – The Lomax, Liverpool. 9th – The Pint, Dublin. 10th – The Parish, Huddersfield. 12th – The Lamp, Hull. 13th – The Old Bell, Derby.